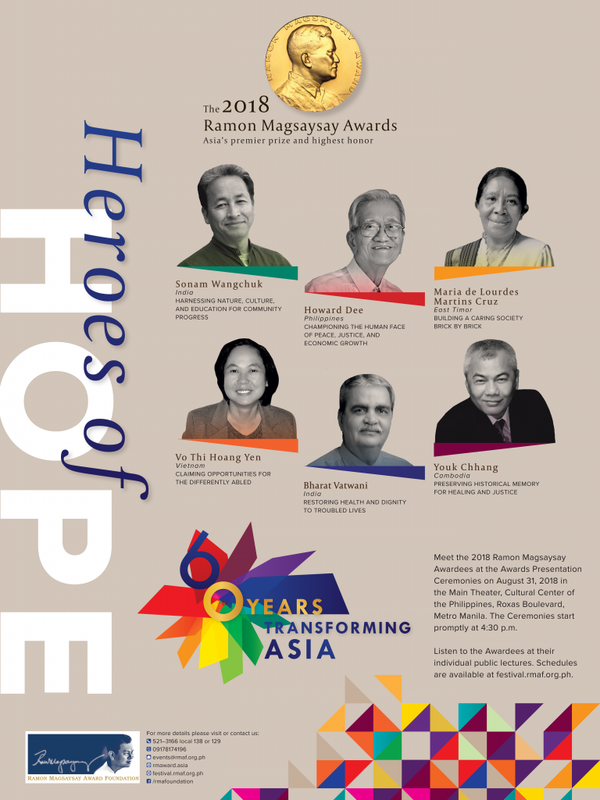 The Ramon Magsaysay Award Foundation (RMAF) has announced the 6 awardees who have made significant contributions to their communities and helped change the lives of the less fortunate. Two Indians Bharat Vaswani, a psychiatrist who works for the mentally-ill street persons and innovator Sonam Wangchuk, whose initiative to harness science and culture creatively for economic progress improved the lives of the Ladakhi youth - were declared the winners of this year's Ramon Magsaysay Award 2018. Here interesting point to note is, Sonam Wangchuk was the inspiration for the character Rancho in the movie '3 Idiots', has been awarded the 2018 Ramon Magsaysay Award for "harnessing nature, culture and education for community progress". Dr Bharat Vatwani, the other Indian to be awarded the prize this year, was honoured for "restoring health and dignity to troubled lives". Here is the complete winners list of 60th Ramon Magsaysay Awards and their details. Senen Bacani, chairman of the Ramon Magsaysay Award Foundation, said this year’s awardees were chosen based on their inspiring vision, creativity and leadership in addressing the problems in their own societies. Established in 1957, the Ramon Magsaysay Award is Asia's highest honour. These awards are regarded as the Asian version of the Nobel Prize. This year's Magsaysay Award winners will each receive a certificate, a medallion bearing the likeness of the late President, and a cash prize.